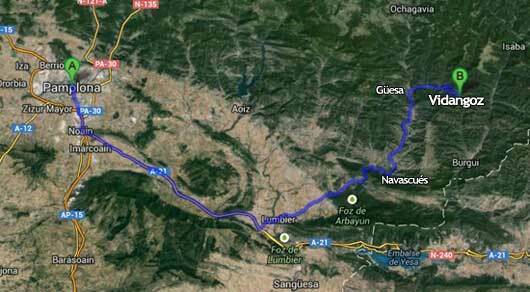 The fastest way to get from Pamplona is as follows: leaving the navarre capital towards Huesca/Jaca by the highway of the Pyrenees (A-21), arriving in about 30 km to the junction Lumbier. Once there, take the NA-178 road towards Navascués - Ochagavía. After about 37 km, and getting to Güesa, take the turning on the right and in 10 km you will reach Vidángoz.